Here I have compiled a few of my favorite golf tips on driving. Learning to master hitting a golf ball with a driver can be one of the hardest and most frustrating aspects of golf. Many golfers struggle with hooks or slices, pushes or pulls. My intention it to provide you will some simple, yet effective golf tips on driving in order to help you hit it more consistently off of the tee. So why is the driver so hard to hit? In general, the longer the golf club, the harder it is to hit it effectively. The driver is the longer club in your bag, and thus, more challenging to hit. Also, the loft of the driver is much lower than other clubs, which makes it harder to get the ball into the air. Related to the loft, the driver creates more friction with the ball at contact which leads to the potential of more sidespin. This page will be updated frequently as I come across more great golf swing advice that I feel like I need to share so please check back frequently. 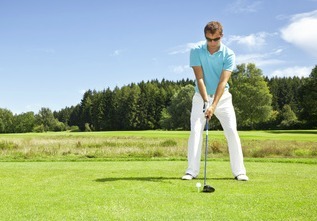 The first golf swing tips for the driver are quite basic. First, make sure that you have a slightly wider than normal stance. This will help you maintain your balance through this powerful swing. However, it is a common misconception that a wider stance is better when it comes to driving the golf ball. A recent poll of the top 100 golf instructors in the United States revealed that the vast majority of instructors recommend that your feet are positioned underneath of your shoulders and not wider. This will allow your to more effectively shift your weight throughout the swing. Also related to your stance, most of your weight should be through the inside aspect of your right foot (for right handers). This accomplishes two things. First, it sets you up for a wider swing arc. Second, it allows your the strike the ball with an ascending club path which will help get the ball into the air and travel. The ball should be positioned forward in your stance, with a very good reference being the inside of the heel of your leading foot. If you are right handed, this will be the heel of your left foot.This will allow your to fully extend throughout your swing and be able to hit with more power. When you swing, it is very important that you do not over swing! This is a very common mistake, but please realize that if you swing too hard, your mechanics will likely suffer. This could lead to an errant shot! This is obviously much easier said than done, because there are very few things in golf that feel better than crushing a drive right down the middle. But do yourself a favor, and slow your swing down because you will very likely have more control and will have a better chance of hitting the fairway. One very common piece of golf swing advice that I have seen is that you should try to swing your driver with the same force that you would swing your pitching wedge. You do not necessarily take full, powerful swings with your wedge so this tip makes sense. Try to swing lighter than you would expect and see what happens. You may be very surprised by the results. Everyone is looking for more distance off of the tee. This section of golf tips on driving will hopefully help you get a few extra yards, without breaking the bank on a new driver! First, one very simple move that you can make to develop a more powerful golf swing is to turn your back foot out. This means the right foot for a right handed swing, and vice versa. Simply rotate your foot from pointing straight ahead to slightly to the right (for right handers). So what does this accomplish? It opens up your hip which will allow for more rotation throughout your swing. More rotation equals more power! Next, another very easy golf swing tip is to snap your lead leg into extension just before impact. This will help transfer weight over to the lead foot as well as promote body rotation. If done correctly, this should lead to a few extra yards with your drives. Another very simple golf tip on driving is to increase the width of your feet. One of the most important aspects of a proper golf swing is a solid base. Widening your stance helps accomplish this. Since the driver is the longest club in your bag, combined with the amount of force that you are typically swinging with, anything that you can do to improve your base will help you get a few more yards. However, don't increase the width too much! As I mentioned above, the ideal position is to have your feet positioned directly under your shoulders. 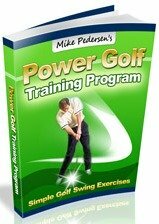 Seeing that the primary focus of this website is golf fitness tips, this page wouldn't be complete without a few ideas of how to improve your driving through exercise. The main factor that I would like to focus on is improving the amount of rotation that you have during your back swing, which can have a direct correlation to more power and longer drives. Improving your rotation will be a combination of a few factors. This first of which is posture. I've have talked about the importance of proper posture on many other pages of this website, but in brief, making sure that your spine is in the proper position at address and through your swing will enable it to rotate further. To check your posture, you will likely need another person to assess you from a few feet away. Assume your normal golf stance and have the other person check how your low back and mid back are aligned. Your low back has a natural curve, called a lordosis, which you want to maintain. You need to keep your low back nice and straight and avoid a hunched over posture. The mid back the other area of your spine to investigate. Keeping this straight, and your shoulders back, will help your shoulders rotate more effectively. The common fault that you will see if that people are too round through their mid back. In most cases, this can be improved through mental awareness, stretches, and strengthening exercises. The second factor affecting your rotation is tightness. This can be present in numerous locations, but the back, hips, and shoulders will be the areas that will limit your swing the most. Please refer to the main flexibility page for specific ideas to target these areas. A couple quick golf swing tips to improve your accuracy off of the tee involve the setup. These tips are from Randy Petersen from www.golftipsmag.com. The first tip involves posture. While setting up, many golfers bend too much at the knees. Only bend your knees slightly at address, and instead, bend forward more from the waist. This will allow for a more complete rotation motion throughout the swing, and will also prevent your hips from moving excessively. The next tip involves shoulder position. Obviously making sure that your feet line up to the target is important, but just as important is making sure that your shoulders also are in line. This is a little bit trickier with the driver because of the longer shaft in addition to the fact that the ball is placed more forward in your stance, which could lead you to open up at your shoulders. Holding a golf club close to your chest so that it is parallel with the ground will help you properly align.